Each family member enrolled in WIC gets a monthly food package designed to meet their nutrition needs. The amounts and types of foods depend on if you are pregnant or breastfeeding and the age of your infant or child. WIC foods are added to your account the 1st of the month on a 3-month cycle after completing a WIC appointment or nutrition activity. Use your family’s Vermont WIC card to purchase your WIC foods at the grocery store. The WIC card works just like a debit card but is specific to your WIC food account. You can shop throughout the month at any WIC authorized grocery store. Scroll down to the section Where to Shop, to find the complete list of stores. You can also watch these videos in नेपाली (Nepali), Soomaali (Somali), Maay Maay, and español (Spanish). WIC approves many different brands and products in each of the WIC food categories: fruits and vegetables, whole grains, eggs, milk, cheese, yogurt, peanut butter/beans, cereal, juice and infant foods. The WIC-approved foods are found in the Vermont WIC Foods guide, also available in नेपाली (Nepali), Soomaali (Somali) and español (Spanish). If you’re fully breastfeeding you get more of some foods such as cheese, eggs and peanut butter and additional items such as canned fish. Food packages change as your child grows. Key milestones are 6 months, 1 year and 2 years. For example, when your baby turns 6 months old, infant foods are added to the monthly food package. When your child turns 1 year old, a child food package that includes whole milk, whole milk yogurt and other foods, is issued. When your child is 2-5 years old, these change to low-fat or nonfat milk and low-fat or nonfat yogurt. Your Family Food Benefits list shows the foods you can purchase each month. You’ll get this list at each WIC appointment. You can also check your current balance using your phone or computer. View the next section Checking your Balance, to learn more. While active on WIC, food benefits will be issued to your WIC account on the first day of each month and they will expire at midnight on the last day of the month. You can stretch your grocery budget and save money by buying all your WIC foods each month. So, it’s helpful to keep track of your purchases and to know what you have left BEFORE you get to the store. Call 1-855-769-8890 (this number is on the back of your WIC card). Enter your 16-digit WIC card number, and the automated system will tell you what you have left in each food category. Go online to connectebt.com, select Vermont WIC and log in. The first time you visit the site, you’ll need to create an account with a new User ID and Password. Check your last receipt for the ending WIC benefit balance. The “ending” balance listed is what you have left in each food category. If you’re not likely to save the receipt, take a picture of it with your phone. At the store: You can go to the Customer Service area where you shop and ask for an account balance inquiry for your card or ask the cashier for a balance inquiry before any items are scanned. Check your balance using the WICShopper mobile app. To choose the right WIC foods at the store, match what is found on your Family Food Benefits List with the brands in the Vermont WIC Foods guide. Make a grocery list of these WIC brands and sizes before you go to the store. Not all stores carry every brand and size of WIC foods. You’ll become familiar with what your favorite store carries. Use the WICShopper App at the store to help you choose the specific product sizes and types of foods that you have on your Family Food Benefits list. 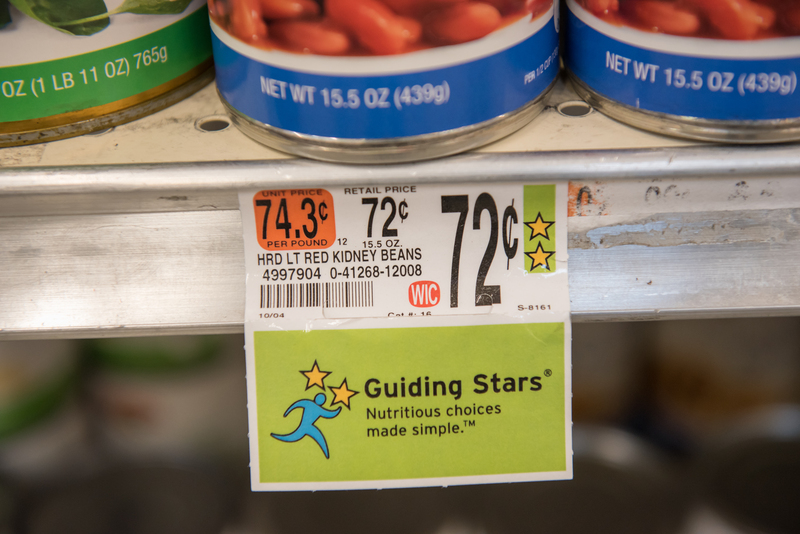 In the store, look for the “WIC” on the item’s shelf tag or the “Vermont WIC Approved” shelf tags to find WIC-eligible foods. Watch the Look for Specific Sizes and Types of Foods video for more tips. Use your Food Guide [also available in नेपाली (Nepali), Soomaali (Somali) and español (Spanish)] and make a shopping list before you go to the grocery store. Check your balance before shopping so you'll know what is remaining on your Family Food Benefits. You can shop at multiple grocery stores to get what you need. You may choose to buy milk, bread and fruits and vegetables at a small, local store and buy your other WIC foods at a larger store, such as Hannaford, Price Chopper or Shaw’s. If you can’t make it to the grocery store, someone else can go for you. Make sure they have your WIC card, your PIN (ID is not required) and instructions about what to buy. Be patient: the eWIC system is still new for the WIC program, the families who use it and the stores that participate. Not a WIC Food but Could Be? If you find a food item that, according to our WIC Foods Guide, should be allowed but is not being debited from your food benefits; or, you come across a product that appears to qualify for Vermont WIC but the swipe machine/cash register system says it is not a WIC item, Please let us know! UPC number, also know as a bar code. Make sure to give all 12 numbers, including the little ones on the side. Separate your WIC foods from your other groceries – at least at first. This will help you while you’re getting to know which foods are WIC-approved. Note: If you have more than 40 WIC items, you will need to divide them into two transactions. Always use your WIC card first. Pay the difference with another payment type, including 3SquaresVT/SNAP, credit or debit card or cash. Swipe your WIC card when prompted and enter your four-digit PIN. Approve your WIC purchase. You will be asked to review a display screen or printed list of the WIC items you are buying. Make sure the WIC foods are listed correctly. Press “Yes” to accept the transaction or “No” to decline. Once you press “Yes” no changes can be made. Keep your last receipt. It shows your remaining food benefits balance and it can help your WIC office if issues arise. What if a food item is not covered by WIC? 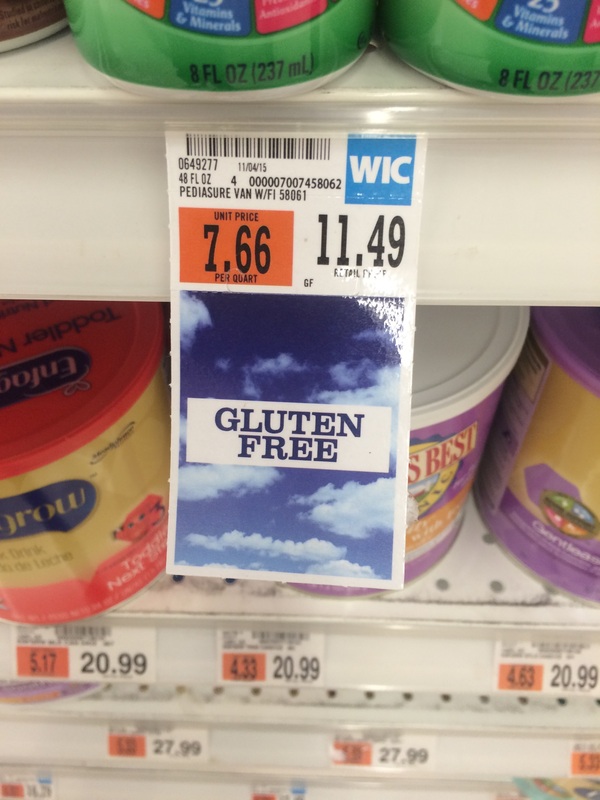 Check the WICShopper App or Vermont WIC Foods Guide to make sure the food is allowed. Check your balance to see if you have enough food benefits for that item. Make sure you have the correct size or brand that is WIC-eligible. 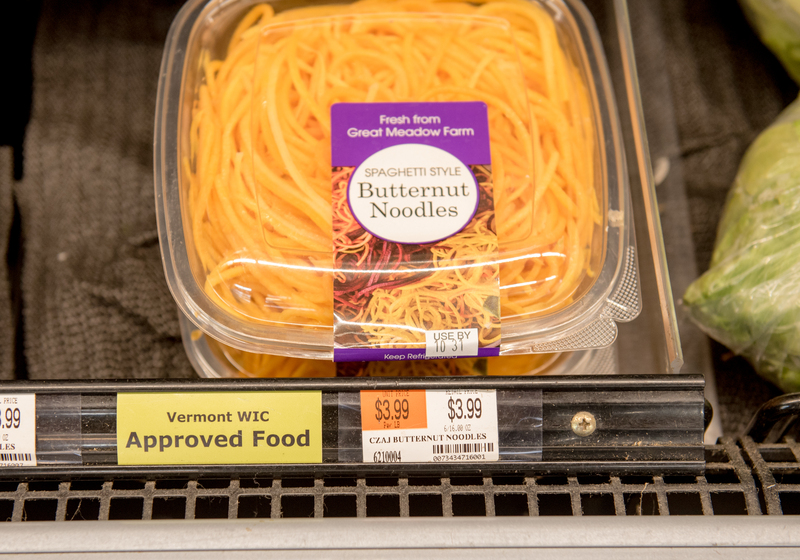 If you think the food item should be allowed but it’s not going through, take a picture of the bar code/UPC and front and back label and share it with your local WIC office or send it in an email to WIC@vermont.gov. You can also call 802-863-7333 or 800-649-4357. Be sure to include the product name, package size and price. If you choose to purchase these foods on your own, WIC cannot reimburse you. But if you change your mind, you can return the items at customer service. Contact your local WIC office if you have questions. What if my card doesn't work? Try again. Sometimes swiping your card a second time is all you need to do. Ask the cashier if they can manually enter your card’s number. If the magnetic strip is damaged, inputting the card number manually will work to connect to your WIC account. Too many incorrect PIN attempts? Call your local WIC office and they can unlock your PIN. Or, you can call customer service 1-855-769-8890 to reset or change your PIN over the phone. Contact Vermont WIC at 1-800-649-4357 or WIC@Vermont.gov. Tell us which store, which lane, the date and time of the transaction and what you were trying to buy. Send us a picture of your receipt if possible. WIC authorized stores can have two different types of WIC checkout systems: Integrated and Separate. Your WIC card cannot be used in self-checkout lanes. When a store is integrated, it means that all your groceries – the WIC and non-WIC items – can be mixed together at checkout and rung through at the same time. The store’s system knows which items are Vermont WIC-Approved, so when you swipe your WIC card first, they are subtracted from your account. Always pay with your WIC card first, then use another form of payment for your non-WIC items. 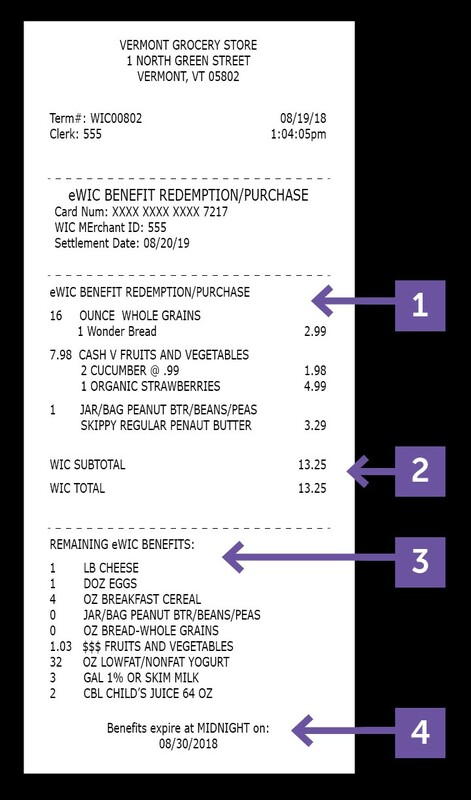 When you are new to WIC, it can help to separate your WIC items in the cart and process them through checkout first so that you’re sure everything you’ve selected is WIC-approved. Then pay for your non-WIC items. Most of the big grocery stores have integrated systems. Many of the smaller stores are also integrated. Some of these stores need you to show your WIC card or tell the cashier you are using WIC before items are scanned. When a store has a separate checkout system, they are using two different scanners. You will need to tell the cashier that you are using your WIC card before any item is scanned. Separate your groceries and pay for the WIC items first so you will know if something isn’t covered by WIC. Then pay for your other non-WIC items in another transaction. Some small stores may have you choose a specific lane for WIC. If you’re new to a store and not sure of their checkout system, ask at customer service or refer the list below. Look for this decal on the door or front window of your local grocery store. If the We Accept decal is displayed, you can shop there with your WIC Card. Look for We Accept signs in the lane at smaller stores where not all lanes may be equipped for WIC transactions. All Vermont Hannaford, Price Chopper, and Shaw's Supermarkets are authorized to accept the WIC card; only the Walmart Supercenter stores in Bennington, Berlin and Derby, Vermont and North Adams, Massachusetts are authorized. Many smaller independent grocery stores, food co-ops and smaller grocery chains are also authorized. In addition, specific cross-border/out-of-state grocery stores are authorized for Vermont WIC. See below for a complete list by store type. You can use your card at any Vermont WIC authorized grocery store. The large chain grocery stores use integrated cash register systems that allow for a mixed basket transaction, meaning you don't need to separate your WIC items from other groceries. By swiping your WIC card as the first form of payment, your WIC eligible items will be deducted from your WIC account; any remaining items are paid for after using another form of payment (debit card, cash, 3SquaresVT). Be sure to use lanes with cashiers (no self-check out lanes). Many smaller chains, food coops and independent grocery stores also have integrated cash register systems. Others rely on separate systems to process WIC transactions. For these stores, you will need to complete your WIC transaction separately. Put your WIC items on the counter/belt first and let the cashier know you are making a WIC purchase. You must swipe your WIC card and enter your PIN before any items are scanned for the WIC transaction to work correctly. Shopping for WIC foods can be challenging at first. It gets easier once you learn what’s in your food benefits and how to find the items and brands you want at the store. Here are some tips from other Vermont WIC families. If possible, go shopping with a friend or family member who is an experienced WIC shopper. In the beginning, there’s a lot to get to know about shopping with WIC, so it is helpful to go shopping with someone who is an experienced WIC shopper. Ask a friend or family member who has been doing it a while and can show you some things to look for. The first time or two, shop early or late in the day when the store is not busy. Your local WIC office staff are happy to go shopping with you too; contact them for a grocery tour. Watch the How to Check Your Balance video, for more information. Pay attention to brands and sizes of foods in each category. You’ll want to check the size of every item on your Family Food Benefits list against what you want to buy using the Vermont WIC Foods Guide. Watch the video Understanding Your WIC Food Benefits, for more information. While you’re learning which foods you can get on WIC, it can be helpful to separate your WIC items from your non-WIC items in your cart and to try a WIC-only purchase first. That way, if you accidentally picked up an item that’s not on your food benefits list (like wrong size or brand) you will know. Since some smaller stores require you to separate your WIC items and pay for your WIC foods first, this will also help at checkout. Let’s face it, WIC shopping can be complicated at first. If you’re having any trouble don’t give up! We are here to help – just ask! Help at the store: The customer service staff where you shop can help you find a specific food item and help you figure things out if something doesn’t go through. Help from your WIC office: The WIC staff at your local office can help you understand your benefits or go shopping with you. You got this! And we’re here to help. WIC foods are for the participating family member. You may not sell or give WIC benefits to anyone else. Contact WIC if you need to change your food benefits, or wish to return any foods you are unable to use. All formula/medical food exchanges must take place at the WIC office. Any unused infant formula must always be returned to the WIC office. Keep your WIC card in a safe place, and do not give your personal identification number (PIN) to anyone except someone who will make WIC purchases as your additional head of household or proxy. If your Vermont WIC card is lost or stolen, report this to the WIC office immediately. It is possible the current month’s benefits will not be replaced. WIC benefits are to be purchased only at WIC authorized stores within the month designated and consumed by the participant for whom they were issued; unused benefits do not carry over to future months. You are responsible for training your additional head of household or proxy to use the card at the store. You are responsible to ensure that your alternate shopper adheres to these same responsibilities. Physical abuse, threat of physical abuse, or verbal abuse to WIC or grocery store staff. Breaking the rules can get you disqualified from the program, fined, or both, and you may be required to repay the benefits.